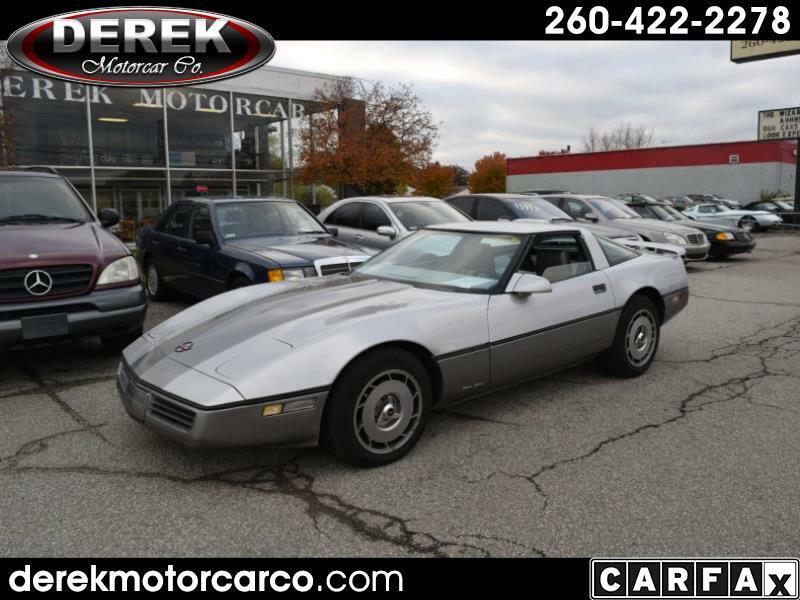 Used 1986 Chevrolet Corvette Coupe for Sale in Fort Wayne IN 46805 Derek Motorcar Co. If you've never had a Corvette, this is your way to experience a part of history, without spending a lot of money! The previous owner just spent $7,000 going through this car to make sure that it is ready to be driven. The two-tone silver over gray makes this car attractive along with the stripe on the hood, rear spoiler and spinners on the wheels. The interior is in very good condition for its age. Hood shocks replaced, fluids checked, oil and filter changed, tire condition and pressure checked, body lubricated, valve cover gaskets replaced, relay replaced, tie rod ends replaced, door locks repaired, brake pads replaced, oil pressure sender/switch replaced, A/C compressor replaced, A/C recharged, serpentine belt replaced, distributor cap replaced, drivability / performance checked, steering / suspension checked, spark plugs replaced. Call and ask for Bob to test drive this fun sports car today.